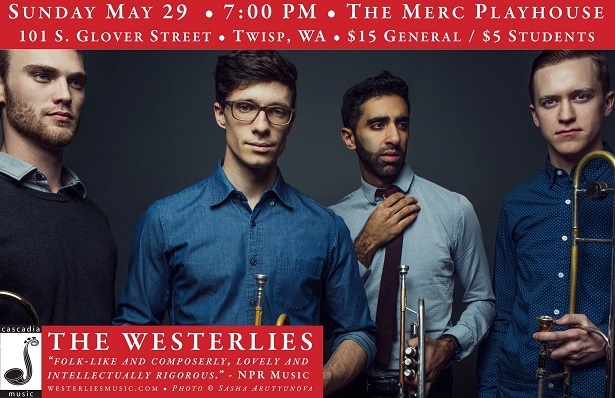 The Westerlies (“prevailing winds from the West to the East”) are a New York based brass quartet comprised of four childhood friends from Seattle, Washington: Riley Mulherkar and Zubin Hensler on trumpet, and Andy Clausen and Willem de Koch on trombone. “Skilled interpreters who are also adept improvisers” (NPR’s Fresh Air), The Westerlies explore jazz, roots, and chamber music influences to create the rarest of hybrids: music that is both “folk-like and composerly, lovely and intellectually rigorous” (NPR Music). Since their inception in 2011, they have shared the stage with such diverse acts as Radiolab, Bill Frisell, Vieux Farka Toure, and Juilliard Dance. Equally at home in concert halls and living rooms, The Westerlies navigate a wide array of venues with the precision of a string quartet, the audacity of a rock band, and the charm of a family sing-along. The Westerlies are currently touring in support of their forthcoming sophomore album, which features original music by each member of the ensemble captured in vivid sonic detail by GRAMMY-winning producer Jesse Lewis (Silk Road Ensemble with Yo-Yo Ma, Roomful of Teeth, Brooklyn Rider, LA Phil). Following their critically acclaimed debut album Wish the Children Would Come On Home: The Music of Wayne Horvitz, this is a boldly personal set of music that is equally virtuosic and vulnerable.